Monofilament polyester mesh consists of single strands of man-made fibers with uniform construction and spacing, plus the finest uniform diameter threads. Holds fine details for printing 4-color process work. Excellent where tight register of colors is required. Also used for graphic applications where clean, crisp definition is required, such as decals, signs, and book covers. 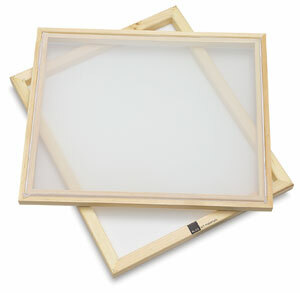 Each frame includes a stretch-tite cord for easier re-stretching.